Literally translated as “sacred/bounteous immortals” (Boyce, 1989: 933), the Amesha Spenta represent six divinities firstly evoked by Agora Mazda who personify his own qualities. The sacred text provide information about this saying they were created “from his own selfhood” (Bd. 1.44), “from his own light” (MK, 8.2), “the lighting of a torch from a torch” (Ayādgār ī Jāmāspīg 3.3-7). It is thus understood that those creatures are united to the Creator in substance but separated in body, being the hypostasis of the own nature of Ahura Mazda and forming a sacred heptad. Firstly, at the Gathas, they seem to be abstract references of moral concepts or symbolic ideals and not creatures strictly speaking. Fundamentally and linked to previous Iranian cults, the Amesha Spenta deify abstract concepts that were interesting to highlight as optimal for the cultural, social and human organization. But at the Haptanghaiti o or the Seven Chapter Yasna —first prose composition from the Avestan perio and written in the Gathic dialect (Dhalla, 1983: 162)— they are mentioned as independent creatures for the first time (Y. 39.3; 42.6). They dwell in the highest Sky were they hold counsel to descend afterwards to the seven parts of the world and rule upon them (Y. 57.23; Yt. 11.14). It is emphasized their non-perishing ability, their perpetual existence to assist Ahura Mazda and his creation and help to defend the dominion of the Asha. 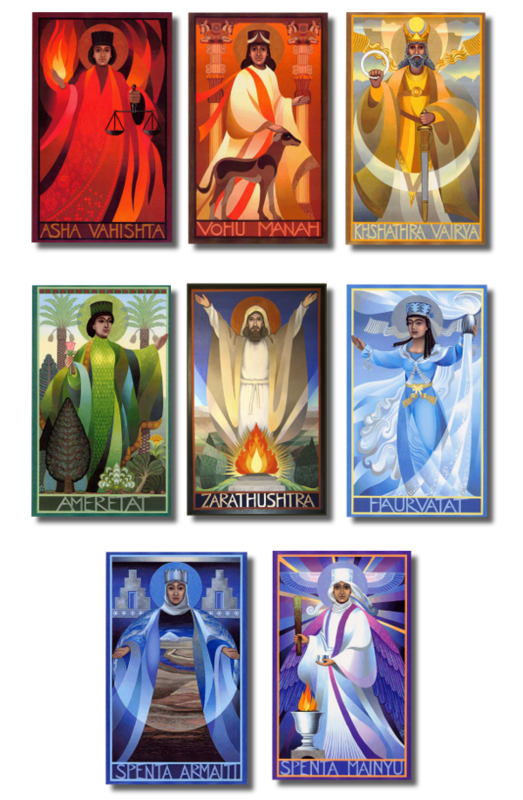 The Amesha Spenta were created to safeguard the creation and their characteristics are listed all throughout the sacred texts: they are everlasting, wise, good rulers, valiant and mighty (Y. 2.2; 4.4; 6.1; 24.9; 25.4; 35.1; 39.3; 58.5; 70.1). Every single one of the Amesha Spenta is linked to an element of creation and, like the yazatas, they are worshiped in their own right by humans. Followers of Zarathustra, who was the first human to invoke them, have to respect and care for these six elements. The bond between those and their immortal guardians is reaffirmed in every act of worship, as they appear visually represented at the same time they are summoned. The immanence of the cult indicates the real importance these creatures had. BIKERMAN, E. (1983), «Anonymous Gods», Journal of the Warburg Institute, vol. 1, nº 3. London: The Warburg Institute, 187-196, ISSN: 0959-2024. BOYCE, M. (1975a), A History of Zoroastrianism, vol. I, Leiden: Brill. BOYCE, M. (1979), Zoroastrians: Their Religious Beliefs and Practices, London, Routledge. BOYCE, M. (1984), Textual Sources for the study of Zoroastrianism, Manchester: Manchester University Press. BOYCE, M. (1989), «Aməša Spənta», Encyclopædia Iranica, New York: Routledge & Kegan Paul, vol. I, fasc. 9, 933-936. ISSN: 2330-4804. CAMPOS, I. (2007), «Ahuras, Daeuuas y Bagas. Una revisión de la terminología religiosa en el panteón iranio antiguo», Bandue. Revista de la Sociedad Española de Ciencias de las Religiones, vol. 1, 35-46. ISSN: 1888-346X. DHALLA, M. N. (1983), History of Zoroastrianism. London: Oxford University Press. HUMBAL, H. (2000), «Gathas i. Texts», Encyclopædia Iranica, New York: Routledge & Kegan Paul, vol. X, fasc. 3, 321-327. ISSN: 2330-4804. KELLENs, J. (1987), «Avesta», Encyclopædia Iranica, New York: Routledge & Kegan Paul, vol. III, fasc. 1, 35-44. ISSN: 2330-4804. KELLENS, J. (1994), Le panthéon de l’Avesta ancien, Wiesbaden: Ludwig Reichert Verlag. Lommel, H. (1927), Die Yašts des Awesta, Göttingen-Leipzig: Vandenhoeck & Ruprecht/JC Hinrichs. LOMMEL, H. (1930), Die Religion Zarathustras nach dem Awesta dargestellt, Tübingen, . 185-236. MOULTON, J. H. (1913), Early Zoroastrianism, London: Constable & Company LTD.
muller, F. M. (2013), The Zend-Avesta, London: Routledge. NIGOSIAN, S. A. (1993), The Zoroastrian Faith: Tradition and Modern Research, London: McGill-Queen’s University Press. West, E. W. (ed. 1993), Pahlavi texts. Part I, The Bundahis, Bahman Yast, and Shayast La-Shayast. Delhi: Motilal Banarsidass. West, E. W. (ed. 2004), Pahlavi Texts. Part V, Marvels of Zoroastrism. Delhi: Motilal Banarsidass. West, E. W. (ed. 2005), Pahlavi Texts. Part III, Dina-i Mainog-i Khirad, Sikand-Gümanik Vigar, Sad Dar. Delhi: Motilal Banarsidass. WILLIAMS, A. V. (ed. 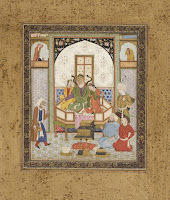 1990), The Pahlavi Rivayat Accompaning the Dadestan I Denig, Copenhagen: The Royal Danish Accademy of Sciences and Letters.